Hodor Doormat is Tragically Terrific | Nerd Much? With Game of Thrones wrapping up next year, it’s important to show just how devastating the series’ conclusion is to you. And there’s no better way to prove it to the outside world than with Merchoid’s Game of Thrones Hodor doormat. The site’s Hodor doormat is a simple mat based upon a simple man. It’s constructed of PVC and coconut fiber, making it durable through extended traffic. And it’s sizeable too with measurements of 40 x 60 cm. 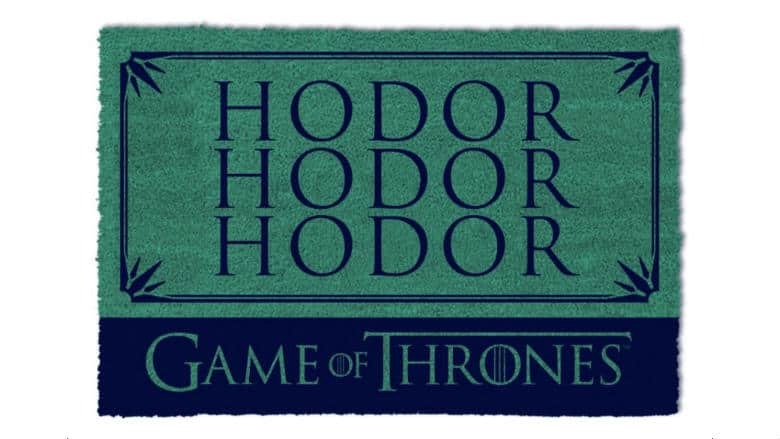 The design itself is green throughout with the Game of Thrones logo layered atop in a dark contrasting color on the Hodor mat’s bottom area. But it’s most registering feature are the words Hodor Hodor Hodor which dominate the majority of the doormat. The words are of course made famous by the gentle giant Hodor who serves as a caregiver of sorts for House Stark. He went through a traumatic event in his childhood that rendered him mentally deficient. Following the event, the only words the character would ever utter again would be his own name – Hodor. It was during the 5th episode of Season 6 that we learned exactly what that traumatic event was which forever changed Hodor’s life. For fans of the series, the Hodor doormat is a perfect encapsulation of the event. It’s unlikely that anyone that watches the show will ever not remember the connection between the phrase “Hold the door!” and Hodor. Back to the doormat itself, Merchoid has the delightfully nerdy decoration listed for $34.99. The site offers free shipping and a 100-day return policy if you should be unhappy with the product in any way. The Hodor doormat isn’t quite ready yet though. Merchoid is accepting preorders with the product expected to begin shipping on December 14th. Which should have the doormat arriving just in time to be a fantastic addition under any Game of Thrones fan’s tree.